In the aftermath of Kevin McCarthy's sudden decision to drop out of the House Speaker election on Thursday, House Republicans are now considering a caretaker speaker, as a way to quickly unify a fracturing party. Unsurprisingly, support for a caretaker speaker is not unanimous, as some do not agree with electing an interim lawmaker to see the party through the next few months, before stepping down. Some, however, are in favor of a quick-fix solution and feel that electing someone with no plans to fill the role permanently is a perfect solution to the chaos that has reigned since current Speaker John Boehner announced his plans to retire from the position on Oct. 30. He's not going anywhere yet, however — on Thursday, Boehner released a statement indicating that he'll stay on as speaker until his replacement can be found. But it's easier said than done, considering that McCarthy, the second highest ranking Republican in the House, chose to drop out over concerns that he wouldn't have enough support. 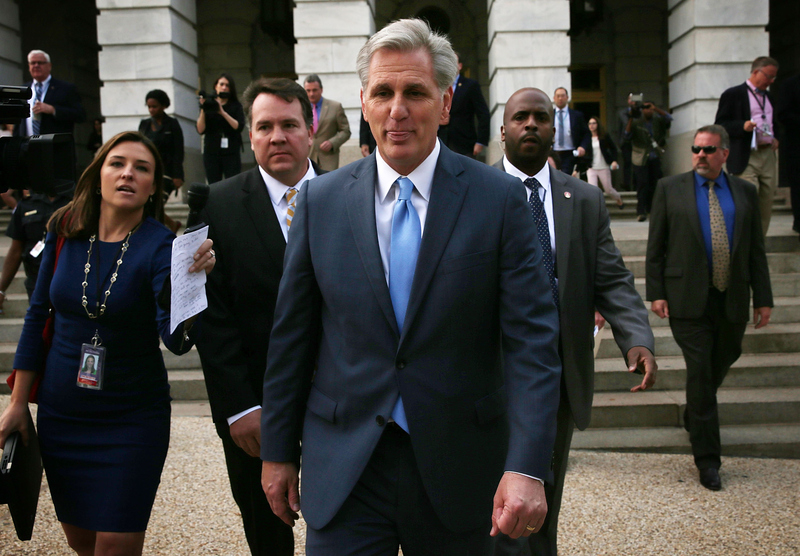 "We need a fresh face," McCarthy told reporters after announcing his decision. "I don’t want making voting for speaker a tough one. ... If we’re going to be strong, we’re going to be 100 percent united." Deciding on a strong speaker to replace Boehner will be difficult, due to pushback by members of the House Freedom Caucus, an organization of conservative representatives. The Freedom Caucus — who were outspoken critics of Boehner's attempt to compromise on Planned Parenthood defunding — were opposed to McCarthy's nomination. Earlier this week, several members of the Freedom Caucus threw support behind Rep. Daniel Webster, a conservative Republican who was previously the speaker of the Florida House of Representatives. But although several politicians have announced their intentions to run for the position, none have the weight or ability to satisfy all factions within the party — except for Rep. Paul Ryan. But the former 2012 vice presidential candidate and current chairman of the Ways and Means committee, despite being highly respected, has no intention of running. Following McCarthy's announcement, Boehner reportedly reached out to Ryan in person two separate times in an attempt to encourage him to accept the nomination. But Ryan remained steadfast. "While I am grateful for the encouragement I’ve received, I will not be a candidate," said a statement released by Ryan on Thursday. But, despite his reticence, Ryan may be the perfect candidate for a caretaker position. Unlike many others in the House, he is uniquely positioned to gain respect from both sides, and could be the only candidate who would be able to quell party infighting long enough to focus on the larger issue of funding the government. And since he has no desire to take up the position, he would be willing to step down in favor of another candidate — once he mollified the party enough for the caucus to be able to sustain a vote. Luckily, even if Ryan refuses the candidacy, there are others who may be willing to take up the mantle — at least for a little while. Minnesota Rep. John Kline, who does not plan to seek re-election next term, has been proposed as a popular suggestion. Meanwhile Greg Walden of Oregon, who currently chairs the National Republican Congressional Committee, offered himself up as a short-term candidate. And although a caretaker speaker is not an ideal solution, it may be the only option. Without a candidate that appeals to all sides, the party becomes increasingly divided, and far more distracted. And their inability to elect a leader amongst themselves sheds doubt on their ability to elect a national leader, effectively halting the legislative progress. "Republican chaos is likely to get worse before it gets better but the economic livelihood of the American people should not be threatened as a result of Republicans’ inability to govern," read a statement released by Senate Minority Leader Harry Reid. Electing a caretaker speaker would be a relatively acceptable quick-fix — not unlike passing a short-term funding bill, in order to keep the government running until a more comprehensive plan can be decided upon. Which is exactly what the Republicans should do in this case: keep the party running just a little bit longer, so they can focus on business now, and infighting later.